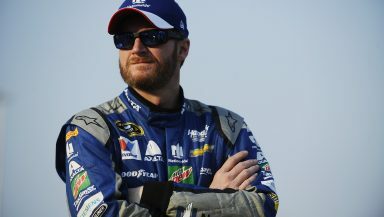 We start off the first offseason View from my Recliner by welcoming back Dale Earnhardt Jr. He completed a test at Darlington Raceway and was cleared by doctors and NASCAR to return to driving in the 2017 season. I do believe that it is interesting that Alex Bowman will drive the No. 88 in the Clash at Daytona instead of Earnhardt. I thought to get Dale Jr. back in the swing of restrictor plate racing, he would drive the 88 and Bowman would drive the No. 5 car. I understand Roush Fenway Racing taking the step back to two cars for the 2017 season. It has been a struggle for that team for the last three plus years. Focusing on the engineering and trying to get the two cars competitive is the right thing to do. The part that has me shaking my head is Chris Buescher moving to the second JTG Daughterty car while under contract to Roush-Fenway. JTG Daughtery runs Chevrolet with support from Richard Childress Racing. You would have thought that they would have kept him in the Ford camp for the 2017 season. The charter system is a joke already and we are only one year into it. Tommy Baldwin has sold his charter to Levine Family Racing, Harry Scott sold his charter Premium Motorsports, Premium Motorsports sold the charter they owned to Furniture Row Racing, Roush-Fenway leased their charter to JTG Daugherty and that is what we know of so far. There are rumors of the 34 Front Row Motorsports team going away and there is no driver/sponsor announcement for Richard Petty Motorsports and that would open up two charters. The Charter system was basically made so that if you are not driving for Joe Gibbs Racing, Hendrick Motorsports, Stewart-Haas Racing or Team Penske, you don’t have a shot at a Championship. Chip Ganassi Racing and RCR are respectable, but not true championship contenders. I hope everyone realized that we watched history at Homestead-Miami Speedway with Jimmie Johnson winning his seventh Championship, starting the race in 40th and climbing through the field and running a flawless race. To show you how impressive it is that Johnson has seven championships when you go through the 2017 premiere series field, only Matt Kenseth, Brad Keselowski, Kyle Busch, Kurt Busch and Kevin Harvick have won Championships and none have repeated. Johnson has more championships than the other 39 drivers in the field combined. That is impressive. We’ll chat from time to time in the off-season and if you get a chance check out the podcast Talking In Circles that you can find on the Speedwaymedia.com homepage. Have a Happy Festivus, Merry Christmas and Happy New Year.